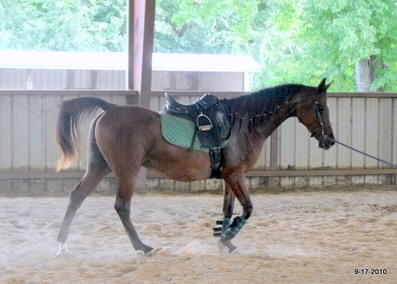 Beautiful, elegant, well-trained pleasure / trail riding / show mare. Loves kids, beginner safe, eager to please. Lots of "go" with a good, safe "whoa." Hunter pleasure, Western or dressage. Loves to "show off" at halter; has been shown Class A "main ring" and sport horse; has completed an ACTHA ride. Cheyene is a Breeders Sweepstakes Original Entry; can win cash if shown. Spanish/ Polish / Crabbet pedigree with 3 crosses to *Bask, plus *Serafix & more. Produced a handsome colt, in 2008; conceived easily, produced huge quantities of milk & was an excellent mother. This wonderful mare will capture your heart. SOLD to Emily Alford of Hallsville, Texas. Congratulations, Emily, on choosing this sweet & wonderful mare as your first horse. Best wishes for many happy years together! I miss her already, but so glad she has such a wonderful home!